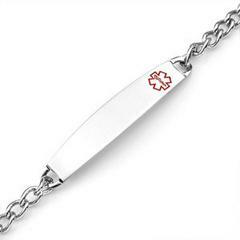 This slender traditional classic style medical id alert bracelet is great for those who prefer the traditional style medical alert bracelet. This can be engraved on both front and back in back laser.The Medical symbol is filled in with red. Wrist size should be approximately 1/2 inch smaller than stated length of bracelet. Attaches with a lobster clasp. Made of hypoallergenic and non-corrosive 316L surgical stainless steel. Sizes Available: 6, 7, 7 1/2, and 8 inch.